Ad spend on over-the-top (OTT) streaming video will increase 20% this year to $2.6 billion, according to a Winterberry Group study of US ad spend data. 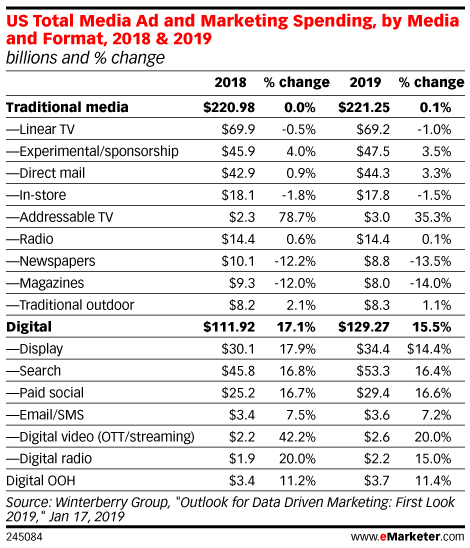 Despite OTT’s surge, it’s still small compared with the $69.2 billion that Winterberry Group estimates US advertisers will spend on linear TV. For some advertisers, measurement challenges prevent them from investing more in OTT. In a 2018 poll by Advertiser Perceptions, a majority of US advertisers said that precise targeting is a leading benefit of OTT advertising; 39% cited detailed measurement. Read the rest at eMarketer.